So I'm suffering from a bad case of treppenwitz today, after yesterday an obnoxious driver cut me off on the road after riding impertinently close behind me. While the situation is all-too-common yesterday's instance of vehicular barbarism stands out because I had the opportunity of having my say with one of those discourteous drivers. At long last after years of abhorrent drivers zooming unpunished into the distance, I had my chance for revenge at Home Depot. Yet just when the moment of triumph was upon me, when I felt the blood summoned up and the shades of Cicero and Demosthenes hovering over my shoulders, the sight of the man moved me to pity. He stood there, a shabbily dressed shlub clutching his crumpled receipt in the return line. The sight of him reduced from marauding Visigoth—so I had imagined him—to simply, "next customer," robbed me of all desire for vengeance. In his fancy sports car he seemed a raging terror. Without it he was nearly invisible. If you noticed him, you might say he was a little over-fed, a little unwitting. Yet the incongruity of his meek comportment and reckless driving fascinated me. What had the machine done to its lowly owner, or what passions had it unleashed and enabled? Was he a basically good man whose demons were let loose at the wheel, or was he a real wretch whose unkindness we strangers were spared only on account of his cowardice? It seems unlikely he was a powerful man who acted meekly but drove like one possessed. Could he have been brazen, or was his apparent indifference the soft confidence of the untested? Worse than such miserable possibilities was the fact that though he stood there an average man whom any onlookers would have said seemed decent and harmless enough, there I and only I knew that on the road he endangered people and treated them badly. Part of me felt guilty, that my gaze made his guilt manifest to all, though of course he did not recognize me as the driver he had so cursorily passed minutes ago. Yet another part of me felt empowered, that I held knew some inner secret of his character. I had still wanted to reproach and reprimand him, but at the same time the sight of him there, not impudent as he was on the road, but powerless, the husk of his car—that mechanical prop of his insensate intemperance—cast aside and his runaway excess laid bare, exited feelings of pity and fear within me. Pity that such ignorance is the lot of mankind, and fear that I seem far less virtuous than I imagine, for who does not imagine that his vices are mild and hidden, and that his virtues are great and self-evident? In the end I prolonged his tragedy and deprived him of the opportunity to show shame and remorse, in part because of my amateur psychological speculations but in greater part because when our paths met again he paused to allow me to pass. In the moment I was flabbergasted. Perhaps his fatal flaw will resolve heroically in self-sacrifice, or perhaps it will find its final resting place when he cuts off a driver like himself. In either case, his ignorance is still my catharsis, for as I envision the day of his reckoning, I imagine my own flaws, ashamed, but encouraged to improve. Alas, though, I finally did think of a real zinger of an insult. When considering the causes of your actions, first consider their type so that you may consider more finely their nature. Did you act by nature, doing what anyone would have done in the situation? Did you do what you usually do? Or perhaps did you do what a certain type of person would do? Did you act according to habit, doing something simply because it was done before? Does the habit do more good than harm? Did you act by compulsion, that is, were your desire and reason overcome by emotion? Did you act to feed an appetite? Are you keeping it temperately controlled, or by either starving or gorging it are you provoking extreme responses? Did you act by reason, trying to bring about a fixed, particular purpose? 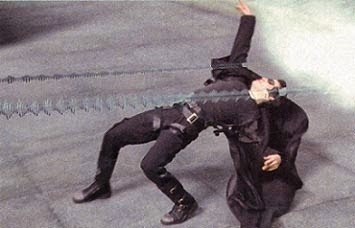 Did you act merely by chance? Perhaps you made a hasty decision without consideration, inclination, or purpose. Do not use this explanation too often or easily. In the last decades before the birth of Christ, as the Roman people learned to embrace the yoke of an ostensibly reluctant autocrat, the historian Titus Livy began the history of his people from their founding up to the final crisis of their ordered liberty. If St. Jerome is correct in setting Livy's birth in the year 59 BC, then it was a propitious date on which to inaugurate the birth of Rome's patriotic, moralist-historian, for such was the year of Caesar's consulship. A nominal consulship for a nominal republic, the year also marked the year when the First Triumvirate–the cadre of Crassus, Pompey, and Caesar–began blazingly to run roughshod over the remnant of the old order. Yet this beginning of the republican end, with its wars foreign and domestic, its sullied politics–oh poor beshitted Bibulus!–and its civil strife were not foremost what fascinated Livy, though he knew these years, the most infamous in Roman history then and now, would attract readers, festinantes ad haec hova, more than timeworn tales about the past, hoary retellings of Horatius at the Bridge. The Old History, Livy confesses, is a happy diversion from debates about the contentious years through which his people had navigated. It is more from that spirit less than that of history proper that I would consider the virtues which animated Livy's history. I do not wish to dwell on comparisons–instructive but dolorous and already complete–to nations long powerful making their own demise, nor will not conjecture whether, paraphrasing Charles Cochrane, mere republicanism can save a republic or mere religiosity religion. Whether traditional republican virtues could be broadly revitalized today and if they could, what effect they would have on the American polity, is beyond my scope here. It is not now my goal to consider history, furnishing examples by which a republic may prosper or decline, yet, labente disciplina, I would look at those virtues which carried the Romans, and which they carried, so far. My approach will be to systematize and rationalize in the Aristotelian fashion of setting means between excess and deficiency, but recall that these virtues were for the Roman traditional, religious, and instinctive. My modest hope is that their presentation might prove salubrious to the individual, not condemnation but encouragement to their prudent consideration and application. Religio is of course the concept with which to start and what today will either offend people or send them scurrying toward some other virtue they hope to practice without any obligation. The essence of religio is not the definition common today, a system of beliefs, but rather constraint of human endeavor in the face of divine force. Religio vetuit, religion forbids. In Gaul after his consulship Caesar, as he slaughtered the Gauls, wrote as praise that they were dedita religionibus, (De bello Gallico, 6.16.1) dedicated to religion, and thus undertook certain rituals for administering to the dead. Underneath the ritual, though, is the recognition of a divine realm with which one must be in accord. Roger Scruton writes, "[Man] confronts in [worldly things] not objects only, but the eyes of the gods, who remind him of his duties and offer comforting socially endorsed instructions." [Scruton, 33] The religious impulse then requires first discrimination, namely between sacred and vulgar, between things of utility and the divine which is for its own sake. Second it requires tradition, accepted practices of propitiation, for those on the rock radices non habent, οὗτοι ῥίζαν οὐκ ἔχοθσιν (John, 8.13) they have no root, and cannot cultivate the seed. When religio reaches extremes we are left either with superstition or materialism, both sharing the common failure to distinguish between the sacred and vulgar. In removing the agency of man, superstition removes his burden of responsibility to discern and act upon the good, enervating both intellectual and moral virtues. In contrast, materialism, in denying any realm which man does not dominate, elevates man to the role of measurer of all things. Nothing escapes his judgment, which is ultimate and which meddles in all affairs sacred and profane, public and private, and through past, present, and future. There exists a balance between the prudential governance of the material world, “a healthy secularism of the State, by virtue of which temporal realities are governed according to their own norms," as Benedict XVI called it, and the acknowledgment that, ipse fecit nos, et non ipsi nos, God mad us, not we ourselves (Psalm 99, 1-2), and therefore we do not dictate all. Laws which are beyond our right to change make claims on us. The virtue of pietas, then, is the acknowledgement and fulfillment of such claims. Piety is the fulfillment not of contract, but duty, the making of vows, not promises, and the consecration of life not by technology or human will, but by sacrament, action given power by the word of God. Lack of piety may stem of course from a lack of religiosity, an indifference to the mystery of the passing generations in which one partakes, but it may also stem from a conscious rejection of tradition. Such rejection begins when one finds tradition onerous instead of ennobling and the rejection takes flight when a tradition is first broken and no one sounds the alarm. 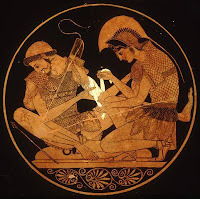 It is not without reason that Aristotle wrote that a man's crime is worse if he is the first to commit it (1375a,) for once the chain is broken and the world does not promptly end, the chain is thought to have been perfunctory, stuffy, tradition. Now it would be easy to propose piety and religious obligation as a panacea for modern woes. Recoiling from this extremity I would consider religiosity and piety as balances upon worldliness. Besides its obligations, religiosity is an inducement to eschew the world of utility, of gaining and spending, and to set something aside as not for meddling. Likewise piety encourages us to consider in our actions and reactions not what we are owed by law, but what we owe by nature. Similarly, and in contrast to the exacting of one's will and the extraction of one's pound of flesh under pain of law, we find clementia, the willingness to forego what is owed. 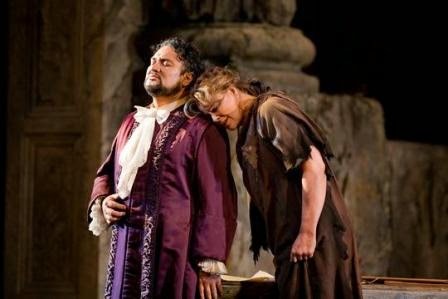 The only exception is Don Giovanni, who thrice unrepentant and bending no knee is dragged to Hell. Of clementia we can see its defect in both the polity and individual, in excessive grievance. When an individual is only sated when he gets what he feels owed, when he must have his pound of flesh regardless of details which out to modify his expectations–such as past kindness, good reputation, virtues which balance vices, intent, misjudgment, misfortune, and human weakness–he is a small man. This man prefers to sue than settle, and as his way is imitated, private reconciliation by equity is replaced by public adjudication. A judge may adjudicate only according to objective legislation and policy of administration. Law is therefore a more harsh and less flexible standard than equity, which may moderate disputes with less severity. After religio, it is likely gravitas which is the most neglected of Roman virtues. After all, who wants to be the stiff rather than the wit, the killjoy than the life of the party? Yet to the Roman mind, man and his life were predominately serious. The disposal of life, literally the putting down of it, that is, the doing of it, is not a trivial business. To carry oneself with gravitas is not to be a pompous, officiating Polonius, but to walk as if your existence has purpose and consequence. Gravitas does not imply seeking attention or conceit, adrogantia, but simply being counted in the reckoning. That hard edge of gravitas is burnished by the good humor of comitas, which bids us be responsible and serious, but not stiff. While gravitas urges us to value our dignity, comitas urges courtesy, an ease which does not assert but attends. If gravitas cautions us not to be timid, comitas reminds us to note the humor of life. Still, as Cicero says, however useful it might be, leve enim est totum hoc risum movere. (De Oratore, 2.218) Humor is a relief, not a mainstay, and comitas should never degenerate into levitas, being lighthearted when we ought to be serious. Ut in vita sic in studiis pulcherrimum et humanissimum existimo severitatem comitatemque miscere, ne illa in tristitiam, haec in petulantiam excedat. Mix, Pliny urges, the light and the severe, so that we do not gravitate toward the extremes of gloom or frivolity. Again, the false appearance of a virtue is the most damaging. 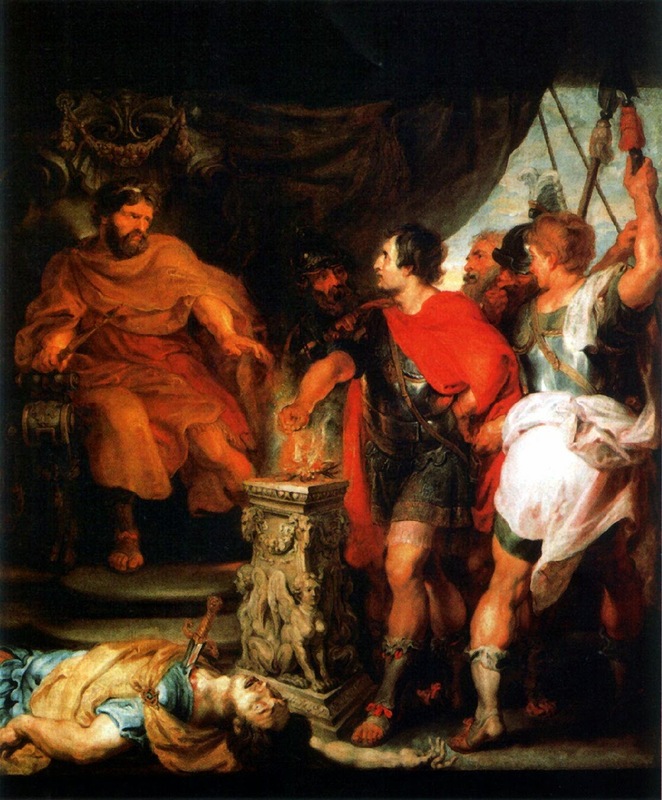 Livy again, writing about Appius Claudius–most famous for the construction of the Via Appia and Aqua Appia under the tenure of his censorship–points to a noteworthy contrast when he observes Appius' fraternizing and canvassing: profecto haud gratuitam in tanta superbia comitatem fore. (Ab urbe condita, 3.35.6) That is to say, the arrogant man may use graciousness to further his ends, therefore in him it is conspicuous. We join the twin virtues of firmitas and constantia, the latter the origin of a most lovely name. It is easy to caricature constancy of character as obtuseness, but apart from Cicero's philosophizing connection of it to Stoic εὐπάθεια, the Old Roman was not a thinker, let alone one of subtlety. He did not value sophistical refutations and live at the cutting edge of philosophical trends. Caesar, less praising now, writes of the inconstancy of the Gauls, consiliis capiendis mobiles (De bello Gallico, 4.5.1), and how they take new plans easily and must retreat from their errors of their foolish fickleness. In amusing imitation of a self-made Roman, Petronius' Trimalchio, the freedman who made it big, wanted written on his tomb: nec umquam philosophum audivit. (Satyricon, 71) He never listened to a philosopher. Roman virtue was a process less of intellect than tradition, and the Roman did not consider a lot of subtle thinking in choosing the right path. It is of course worth exploring the philosophical tack in Tusculan 4.12, in which Cicero, summarizing the Stoic position, observes that man naturally seeks what is good and thus what seems good, but in seeking his desire is twofold: either founded in prudence, called volition, or founded in violent desire, lust, which is found in fools (in omnibus stultis invenitur.) Therefore incitement of the former is joyful, whereas excitement of the latter is immoderate elation away from the control of reason. Thinking from the Stoic position, then, we can view inconstantia as an immoderate, immature response to the appearance of the good. It is appropriately associated with youth, who seeing the various goods cannot choose among them but move from one to the other. One extreme of constantia is of course obtuseness, literally dullness to other observations. This stubbornness can manifest itself as A. pride, for example an intelligent man ignoring reasoning which contradict him, B. anti-intellectualism, an irrational distrust of thinking subtler or finer than our own, or C. traditionalism, distrust of the new. The other extreme is fickleness, in which we find A. an irrational distrust of our own judgment, B. the excessive worship of reason, which trusts what is argued more than what is demonstrated, and C. faddism, which prefers the new simply because it is new. The obtuse persist in error and the fickle wander from error to error. Constantia then requires disciplina, the learning by which one chooses the good, for he cannot attain the good if he does not aim at it, and who can aim who does not see his target. Let us commend, though, the discussion of humanistic and Christian education to elsewhere, and discuss frugalitas, satisfaction in economy. Of frugalitas Marcus Aurelius spoke best, recalling what he learned from his adopted father: enjoy the luxuries which fortune may furnish, but do not miss them when absent. (Meditations 1.16) Live neither as a pauper nor helluo, poor man or squanderer. All of these virtues require two more: severitas, the strictness to moderate oneself, and virtus, one's manly essence and full worth. Of all we have mentioned these virtues are perhaps naturally twin, for the exuberance and outward exertion of the virtus implies a need for severitas, a restraint. The virtus must be cultivated, surely with the good allowed to grow and the bad pruned, but even with the good pruned moderate, lest even one good grow at the expense of choking some other virtue. The excess of these virtues are the most gross, and their defects the most pitiful. Untutored and unmoderated, severitas mistakes self-debasement for self-mastery. Severitas degenerates into excessive fault-finding and doubt. Excess severity is paralyzing, not ennobling as severitas should be. In detriment of severity we find excuse-making, as inimical toward manliness today as it was ever. There is no protection against his fundamentally destructive energies... He is the logical consequence of the Enlightenment's cult of individualism and unrestrained liberty. In detriment the manly spirit is timid, weak, and enervated. It is cowed when it should be assertive, sluggish when it should soar, and reluctant when it should be ready. Reason fusts in him unused and he plods, but sleeping and feeding. The modern idioms of looking at oneself in the mirror with pleasure and waking up in the morning with gusto might have pleased a Roman. Wake up neither with regret nor ready for mischief, the extremes of severity, but prepared for a prudent and disciplined day, and seek in the mirror neither the prideful nor pitiable, the extremes of virtus, but the cultivated self. Barrow, R. H. The Romans. Penguin Books. Middlesex. 1949. Duff, J. Wight & Duff, A. M. A Literary History of Rome. Barnes and Noble. New York. 1960. Scruton, Roger. An Intelligent Person's Guide to Modern Culture. St. Augustine's Press. South Bend Indiana. 2000. If there is any idea which does not excite, it is moderation. Moderation lacks the pizzazz of excess, with all of its bells and fanfare, and even deficiency can arouse amusement by the shock of insufficiency. Even the ancient fonts of wisdom seem to avail us of little help, for how inspiring is the thought of the auream mediocritatem. Yes it says golden mean, but who can look at that phrase and not see mediocre! shining through Horace's Latin? It is perhaps the fate of this idea to find no easy selling point, no hook by which to snag potential moderates. Even those meticulous verses of Horace in which moderation comes to life in full grandeur and gravitas, even the meticulous logic of Aristotle which proves moderation wise, such persuasions do not excite one to moderation. We may undertake it out of emulation or prudence, but never out of enthusiasm. If one takes the leap of moderation, though, one finds its practice nothing short of thrilling. How is this possible? First, moderation gets you thinking. It is not so hard to glob onto an extreme and pursue it toward appalling excess without thinking, but to be moderate one must examine both sides, as far to their extremes as possible. This process is not only stimulating but entertaining, and no small part of life's intellectual pleasure comes from the consideration of the absurd. More practically, in examining extremes we are arguing for and against the one which we prefers by inclination. As such and second, moderation encourages self-examination by requiring us to consider alternatives to one's habitual or natural preferences. Thinking about oneself–not from a sense of narcissism but of humility–is typically an intense task, requiring repeated reflection and consideration. Thinking of oneself then promotes, thirdly, thinking of others, a task which is likewise without end. How many and how happy are the moments of remembrance, calling to mind the wise and prudent with as much pleasure as the imbecilic. Of course this reflection takes the forms of empathy and criticism, which both lead back to considerations of ourselves. Reflectivity aside, though, the pursuit of moderation makes each choice an exiting, vital one. Upon the precipice of each action moderation imbues us with purpose both moral and intellectual: Can I figure this problem out as a rational man? Can I negotiate these waters and find the just end? Speaking of which, moderation makes us consider ends. When we considers the extremes of behavior we also consider their effects, likely preferring to avoid one. In a choice, for example, between upsetting two people, we may learn whom we fear to hurt, or perhaps which principle prevails in our heart. Absent considering alternatives, such knowledge remains obscure. Of course all of these exciting effects are those of process, and as exciting as they are, I find the thrill of moderation chiefly to lie in its success. How often after I've chosen just the right word, just the right time to interject–or more often, to be silent)–or even the proper time to stop chowing down, do I feel that I've dodged a bullet. In contrast, failures of moderation in both excess and defect always find the same ends of shame and regret. Like walking out of a movie which is too short or slight, defect stirs feelings of disappointment, as one leaves an overlong film numbed insensate. Finally, we see that apart from the salubrious effects of moderation we find that moderation seems to magnify the spirit. In examining a choice, viewing the alternatives, and then choosing what one deems prudent, we find the happy, just, and of course moderate joy in the exercise of our will. Not the will of whim, but of virtuously directed agency. Choices never seem so mine and I never seem so in control of myself and my life than when I act with moderation. In contrast, following instinct and habit, conniving or striving to get what I wanted before thinking about all sides, makes me feel small. I feel then feeble, as if I can only be happy when sated. Contra expectations of stuffy, stodgy, mean-finding, moderation is nothing short of choice itself, for who can be said to choose who does not look to all ends, and whom do we say, of course, sees all ends? 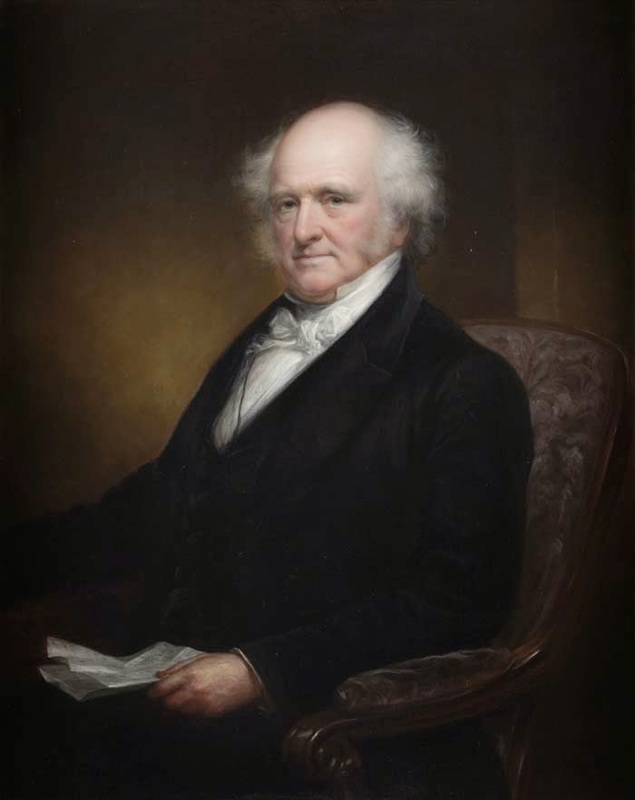 We continue with our present look at the rhetoric of Martin Van Buren's inaugural address. Will there be any stylistic curiosities in this speech from the New York-born, Dutch-speaking president? 1. Fellow-Citizens: The practice of all my predecessors imposes on me an obligation I cheerfully fulfill—to accompany the first and solemn act of my public trust with an avowal of the principles that will guide me in performing it and an expression of my feelings on assuming a charge so responsible and vast. In imitating their example I tread in the footsteps of illustrious men, whose superiors it is our happiness to believe are not found on the executive calendar of any country. Among them we recognize the earliest and firmest pillars of the Republic—  those by whom our national independence was first declared,  him who above all others contributed to establish it on the field of battle,  and those whose expanded intellect and patriotism constructed, improved, and perfected the inestimable institutions under which we live. If [A] such men in the position I now occupy felt themselves overwhelmed by a sense of gratitude for this the highest of all marks of their country's confidence, [B] and by a consciousness of their inability adequately to discharge the duties of an office so difficult and exalted, [C] how much more must these considerations affect one who can rely on no such claims for favor or forbearance! Unlike all who have preceded me, the Revolution that gave us existence as one people was achieved at the period of my birth; and whilst I contemplate with grateful reverence that memorable event, I feel that I belong to a later age and that I may not expect my countrymen to weigh my actions with the same kind and partial hand. While the opening sentence begins with the now traditional sentiments of modesty and following in the footsteps of great predecessors, two words stand out: cheerfully and happiness. This is the first time any degree of cheer or joviality has made its way into any inaugural address, and while these words don't constitute frivolity, they do mark a uniquely festive sense of gratitude for having inherited such a great nation from such great men. Van Buren's use of the word calendar is also worth a note, for on the one hand it can simply mean register, but also it can mean guide or example, and even by metonymy it can refer to the history of the presidency. The firm image pillars of the Republic is no throwaway, though, but itself becomes the foundation for the rest of the paragraph. Van Buren breaks the Founders into three groups of those who 1) declared independence, 2) fought for it, and 3) those who firmed and expanded it. This is a novel and engaging way of reiterating the feats of the Founders, and note with him who the indirect reference to the now nearly deified Washington. The next sentence is a gradatio of increasing tension from phrases A-C, but it reads simply as a condition: If A and B, then C. Van Burn ends with a most surprising turn, an invocation to the people to regard him not as one of the Founders but to regard him as one of them and to judge him not with the gentleness with which they treated their forefathers, but impartially. A most uncommon sentiment, in and out of politics. who fall into three categories. how much must I be? so judge me as one of you and not one of the Founders. This is a solid opening, full and formal but not orotund, and tightly organized. but more noteworthy they suggest that somehow we should "talk about" and recognize the danger, as if courage is its natural companion. Is this so? We need to recognize danger so we can recognize courage, but to recognize courage we also need to know the man. N.B. Some of the following is paraphrase or summary of Aristotle and some my own explanation, extension, expansion, and examples. The full text of the Ethics is here for your examination in English and here in Greek. What a great number of conditions on which Aristotle predicates the first of virtues. Whom do we not call brave, then? One can fail to be brave, 1) by being unaware of danger, ignorance, 2) by giving into fear and fleeing the danger, cowardice, 3) by not fearing that which a man ought to fear (such as disgrace) out of a) recklessness (rashly meeting the danger), b) overconfidence (arrogantly meeting the danger), c) imprudence (fearing the wrong danger), or d) shameless indifference to the good, or 4) by fearing at the wrong time, such as fretting before one is in veritable danger or fearing only after it is too late to act. Aristotle also presents us with situations in which a man may seem brave, but is not so at all or not in the purest sense. First, Aristotle discusses those who fight by compulsion, such as citizen soldiers. The may be brave in facing danger and avoiding shame, but they may also do so out of fear of penalty, rather than out of nobility. Second, consider also a professional with a risky job, even a professional soldier. These people have special knowledge and/or tools to deal with specific dangers, and their experience has given them special confidence with which to approach the challenge. These people are very good at their jobs, for the strongest not the bravest men fight the best, but their bravery is not the purest form. Third, those who act from passion have something akin to courage, but not what we have called true or pure courage, for they act not from honor or nobility, but from strength of feeling. Passion may aid the noble man, but he does not act driven by feeling but from nobility. 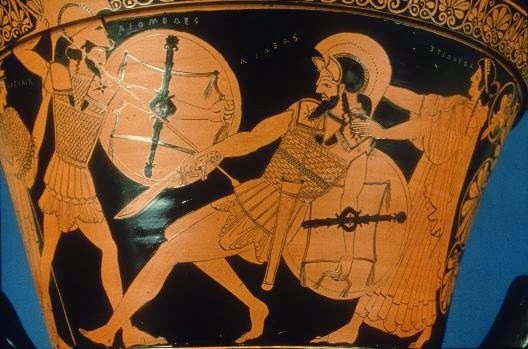 Fourth, the confident (εὐέλπιδες) man who faces danger which he has conquered before may not exhibit pure bravery, if previous success has made him feel unconquerable. Facing risk with the expectation of success is not the same facing a danger which you think may kill you. Likewise facing a sudden danger with courage exhibits more bravery than reacting with preparation, for the former results not from preparation or expectation but a state of character. Finally, we must say that it is the greatest of losses which is the ultimate concern of the brave man: death. As such, the courage of the noble and happy man is intensified because he at the risk of losing or in preservation of his good and finite life, risks death. Where does this leave our discussion of people who face danger, such as farmers, police officers, sanitation workers, fire fighters, and soldiers? It would seem to leave us with an inability to call any of these entire groups brave. For the character of the individual and how he approaches danger, not the danger itself, constitutes courage. By what quirk of fate I know not but the quote above fortuitously percolated its way to my attention in my Twitter feed this afternoon. I say fortuitous because of the wonderful counterpoint it plays to a short story about gratitude I came upon this morning, also by chance, via a friend. From him I read a brief expression of love from a woman, now passed, for her grandson. "What a joy you are to me," she wrote. Now I did just say the letter expressed love but truly the first word that occurred to me was thanks. We of course will not indulge that facile tendency to say that two things are the same but there is of course much of thanks in love. A specific kind of thanks, mind you. It is not the thanks for equitable exchange or thanks for justice. It is not even strictly thanks for kindness since the kind act, for all its good, can be done simply for the sake of kindness and not the individual. It is not even thanks for emulating, that is to say, thanks to someone for providing a good example. Why? All of these forms of thanks imply some kind of utility, ulterior gain, or adherence to some other principal to which the deed is ancillary. As The Philosopher instructs us, friendships of utility love not for themselves but some good gained, that is, some good for you, be it pleasure or convenience. These relationships are facile and feeble. Often they are not even mutual but when such utilitarian friendships are mutual it is best when each gets the same from each. We may observe in the above examples there is indeed, though, some element of thanks, of gladness at the happy accident, the fortunate turn of events, a kindness, an obliged return and so forth. Yet from any of the Latin forms, grates and gratus, it is hard to tease out from the quotidian sentiments any pure sense of unobliged, useless thankfulness, what I propose to call gratitude. Useless, I say? Yes, useless, though it may sound a strange thing. We scarcely realize it but we are trained to use things, all things. Commerce, rather reasonably, trains us to use things. Today art trains us to use it and it is indeed use because without any sense of purpose such as religiosity or beauty it can only be used, to rouse and pleasure or relax and mollify, even to conjure an image or emotion. Such works, even great ones, exist to do and do for you or even to you, rather than simply be. Education too teaches us to use. Science teaches us to use nature only to manipulate it and to gain knowledge to get a job. English teaches us to write just to learn about ourselves. Economics teaches us to work only so we may spend. Even philosophy itself is abused to the point of utility today because without some view of man's nature and his good, whether it be Aristotle's contemplative life or some other, without true philo-sophia, it is simply a tool of breaking down, of de-struction. The love of someone or something for its own sake then is something quite special. To have gratitude not toward but for someone and not because of any qualities but for the sum of that person, to have gratitude for a work of art not because of what it does but what it is, is to have gratitude for that which makes up an important part of living. To know such gratitude, in giving or receiving, is to make a joy of being in the world, and thus "that gratitude is happiness doubled by wonder." It is an annual goal of mine to attempt, throughout a year, to observe one particular idea in detail throughout the many circumstances a year will provide. This past year of 2011 I observed the ways in which people compliment each other and I must say the inquiry has proved rather revealing. This year I noted that people tend to praise others as "smart." Now I suppose I ought to make an anthropological caveat and explore the possibility that in my presence people might praise others as "smart" because they figure, incorrectly, that I am reasonably smart and thus would value intelligence in others. If this possibility has ever been true the fact would puzzle me. Why would one person possessing one virtue not recognize or value excellence in the others? This question is, in fact, the essence of my inquiry. More specifically, where is this bias in favor of intelligence and what do people mean by "smart?" Let us attempt to answer the second question first and in doing so turn our attention to Aristotle. We can observe that Aristotle makes a number of distinctions amongst the Intellectual Virtues, what we gloss over as "intelligence." In brief, Aristotle mentions 1) techne, what we might very loosely consider a particular skill, 2) scientific knowledge about universal principles derived from logical argument, 3) practical judgment, that is, the ability to judge the good for man in a particular situation, 4) knowledge of first principles, and lastly 5) wisdom, a combination of knowledge of first principles and reason. As useful as these distinctions are, and their usefulness and the keenness of the mind who made them are revealed even upon the most cursory consideration, they do not seem at all akin to what people mean when they say "smart." Craftsmen are seldom referred to as smart and I have never observed "smart" to refer to anything so specific as formal training in logic. In fact in my observation I seldom nonticed "smart" used with any connection to particular knowledge at all. Of Aristotle's subsets of "intellectual virtue," nous, or the ability to observe first principles, seems to be closest to what people mean when they call someone "smart." Yet people tend to be unable to point to first principles that a "smart" person does know. How do you know he is smart then? They usually form this judgment based on a perceived readiness or cleverness in conversation or simply general competence, but not from serious consideration about the nature and degree of the person's intelligence. This fact brings me to my conclusion about the significance of this last virtue, "smart." It is tempting to suggest that "smartness" survived as a virtue because as a society we value intelligence most and there may be some truth to this but I think "smart" survived simply because it was the easiest to corrupt and indeed it has been corrupted into a meaningless catch-all compliment. Most significantly, though, is that unlike all of Aristotle's virtues, it is not connected to action. It requires no learning, experience, or contemplation, unlike Aristotle's Intellectual Virtues. "Smartness" requires nothing of its possessor therefore it is a "virtue" anyone can have. You need to do practically nothing to get it and there is nothing you can do to lose it. It is an invented virtue to compensate for the loss of classical education (that is, Aristotle's Intellectual Virtues) and the social abandonment of Aristotle's Moral Virtues. Speaking of them, where did they go? When was the last time you heard someone (other than a warrior) described as courageous? Or anyone described as temperate or moderate, or liberal, or good-tempered? Instead people are glossed over with meaningless adjectives. These vagaries are both, I would wager, accidental and convenient. They allow us to praise and condemn at whim without reason and consideration and worse they give us the illusion of being discriminating. They allow us to create a safe-zone around ourselves and others which cannot be breached. If you're "smart" you're smart and nothing can change that. You might be deficient in every other virtue, but you're still "smart." Well, "smart" is not a virtue. There are in fact many others, though, all of which are worth perceiving, valuing, and cultivating. Perceiving is of course the first step but the second is perhaps even mor difficult: judging yourself and others based on these virtues. This is not something we like to do and it can be taken too far, but it is a necessary step toward a meaningful life in which people are better, are more, than "nice" and "smart." 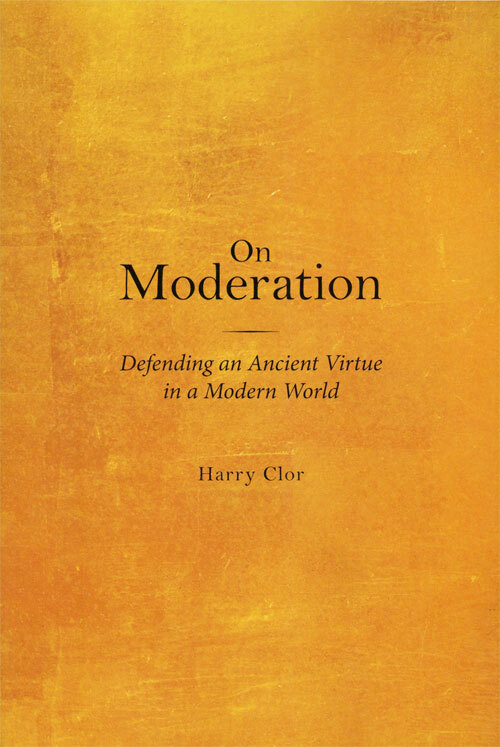 I have tried to imagine a reader who would not benefit from Harry Clor's On Moderation, to find someone for whom this volume is of no use. Surely this book must be redundant for the philosophically literate? No. Too esoteric for the layman? No. Too long? Certainly not, at 120 pages. On Moderation has enough of tempered sagacity to earn the trust of the old and enough challenges to common suppositions to stir the youthful. It is neither sententious nor witless, chastising nor therapeutic. It neither overwhelms with footnotes nor suffers from a lack of references. On Moderation is for everyone. Perhaps it is a banal, even hokey, compliment to say that a book titled On Moderation is itself of moderate proportions but such is quite a feat. How might we fare weaving the thread of one of Western Civilization's oldest ideas throughout all of its history? And not just through its treatment at the hands of philosophers but by authors and in the lives of political figures? And then presenting it in a clear and useful form for any reader? Quite a feat. Why attempt it, though? Why be moderate? To answer this question we obviously must define the idea and Clor divides the task into three categories: What does it mean to practice, 1) political moderation, 2) personal moderation, and 3) philosophical moderation. In each Clor seeks out the the proponents and examples of moderation and issues which seem to present challenges to moderation, i.e. people and problems who urge or seem to require some more extreme course of action. Present throughout is the author's own moderation. In particular Clor is always attentive to the alternative sides of an argument, the limits of what one may know of particular circumstances, the potential to gain insight from a position that seems generally wrong or unreasonable, and lastly that there exists a multitude of goods and one may not always attain them all. First off, anyone who has taught for any duration can spare a chortle for his experience. More to the point, though, Clor (citing the late Martin Diamond's amusingly-titled essay, "The Revolution of Sober Expectations") observes that the revolution was moderate as far as revolutions go. Unlike the French and Bolshevik ones it did not seek to overthrow all of society, to change man's nature, or to attain a massive list of rights. No one marched in the streets chanting, "We will have equality or we will destroy civilization," as in the French Revolution. Clor uses this example to demonstrate how moderation in political life consists in part of putting up with defects or limiting aspirations in order to bring about some good (presumably enough so that the defects are bearable.) Some may find this approach unsatisfying and tantamount to a revisionist approach in which certain events are demonstrated really to be moderate, yet another of the author's points provides a corrective to this criticism: that perspective and an impersonal distance are required for political moderation. One must step away and examine the issue, and its extreme positions, in order to perceive the moderate position. Another aspect of political moderation Clor identifies is that of acknowledging a multiplicity of principles. Not mere conflict and strife, he points out, but multiple values deserving of your attention and which must be balanced, though preserving one may damage the other. Similarly, Clor identifies the principle of proportionality as appropriate to political moderation, finding it in the American system of government which achieves the balance of "constituted representative democracy" in contrast to "radical populistic democracy." Applying Burke's words to the American system, one may say that it "tempers together those opposite elements of liberty and restraint in one consistent work." In contrast to the aforementioned principles of moderation Clor finds the so-called "value pluralism" unpersuasive as a force of moderation, for while its toleration is preferable to polarized struggles for control of the state, "tolerance by itself does not produce the sense of community on which it depends." [Clor, 20] That is, toleration is really only plausible when some underlying fundamentals, often unspoken, exist. Too, value pluralism, extolling diversity itself as a virtue, requires one to praise all walks of life and actions as good without recourse to any particular understanding of a "good life." Well how can they all be good? One of the most important aspects of political moderation Clor picks up from Aristotle, who argued that we "ought not expect more precision from our study than the subject matter permits." This means not that there are no universal truths but that prescriptions to bring them about or abide by them may only be offered in outline because particular instances are variable. A few obvious examples follow, namely the two which philosophers have wrangled with and tried to, once and for all, proclaim as evil: lying and murder. Are they not sometimes the lesser of evils, for example if they prevented mass devastation? Too, does power really "always corrupt" or is it sometimes necessary as a force to counter evil? Clor infers two points from Aristotle's observation: 1) do not attempt to turn politics into an exact science, and 2) don't turn ethics into a body of categorical imperatives. Do so, and every political decision you make becomes an intractable one without any hope of negotiation. If all issues are moral ones, then no societies are possible except for ones in which everyone agrees about everything or about nothing. Most societies reach some degree of moderation, permitting some things and forbidding others. A "moderate" political citizen then, with these "situational ethics" in mind, has much to observe in trying to negotiate what is and is not acceptable. Yet what happens when something is finally decided upon? It is usually made into some kind of law. How useful is this? Clor, again channeling Aristotle, notes that on the one hand laws are made by fallible men and thus may be biased and imperfect, and on the other they are still more dispassionate than any human judgment would be on the spur of the moment by virtue of their distance from the event in question. Again, on the one hand the law provides an impartial standard for a situation and on the other there are times when a "judgment call" is needed. It is hard to foresee every circumstance. Sentencing someone to life in prison for violating a rule which has been superseded or rendered defunct would be "excessive legalism." The rule of law itself, then, is a moderator in need of moderation. Finally, then, the politically moderate man must be able to balance the demands of various principles, to calculate reasonable goals, to admit a degree of uncertainty to the situation, to refrain from moralizing, to be diligent about obtaining the facts, and maintain capacity for disinterested examination. Too, he must remember that all men are subject to passions and that even reason may find itself passion's instrument. Nietzsche contest with the ancients for man's nature is at heart of this chapter. For both parties man may be of two natures, of reason and chaos, but in which does his ideal state exist? The former sees in chaos the will to create and the latter in harmony the happiness of man. Does reason reveal the path to prosperity or does it simply saddle and devitalize one's passions and inner drive? 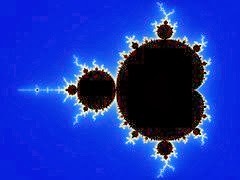 After laying out the arguments for passion and reason, for order chaos and order, Clor makes a recommendation for moderation all the more powerful and sensible for its brevity: Are we not reasoning and social creatures, do we not carry various imperatives and entertain different claims upon us? Is an energetic or happy human really one in which many of these claims lay undeveloped? Relax control, maybe here and there, but only if you have a moral constitution as the norm. Clor concludes, "the demands of rationality may be relaxed by a mind in which reason retains a prominent voice." [Clor, 58] Such moderation feels almost like a relief from the extreme claims. While discussing man's capacity for passion Clor makes an interesting stop to discuss compassion. Yes, of course it maintains certain personal and social benefits. Yet is it somehow overrated? Perhaps, but perhaps one simply ought to distinguish more finely just what it is. Sometimes compassion is simply rooted in a fear that the same thing could happen to you. Second, you may feel pity and empathy for someone's suffering but such is not the same as persistent concern for his well-being. Neither of these instances of "compassion" are quite so laudable as we might think. Lastly, one may indeed be deserving of compassion but also of anger or indignation. Compassion is not a virtue, something that refines a passion toward some good end, but a passion itself. As such, it requires guidance and consideration of goods since it can be properly or improperly directed. Yet if some passions are moderated, how is this accomplished? It seems foolish to think that one can "temper impetuous impulses by remonstrating with them." To Aristotle, one's habits and dispositions, the ways in which the passions are incorporated into one's disposition, moderate otherwise unrestrained desires. Repeatedly choosing an action, under whatever guidance or communal pressure, slowly makes that way of dealing with the passion part of who you are. Personal moderation, like political moderation, would seem to require much of the individual. In fact it requires nothing less than an awareness of self and society. It requires rationally choosing values but also understanding those which one has unconsciously acquired through habituation. It requires building a character but also understanding the values one has inherited as an individual in a particular family and country and even those one has by chance. It requires measured introspection and accordingly corrective action, not dogmatism or unlimited "openness" to any outcome. It requires having a character, which necessitates the ability to perceive a situation and reason what the right thing to do is, and then the will to temper oneself. One might say it requires both wisdom and virtue. Indeed, postmodernist anti-reason ideologies do not promote questioning traditional thought so much as they "render the injunction 'know thyself' virtually meaningless." [Clor, 88] Such attacks on rationality of course also affect all norms and standards, which "are dissolved under the acids of a critique that pronounces them to be groundless if not fraudulent." Clor refers to this as an "ultra-libertarianism," quoting Dostoevsky's disapproving observation, "everything is permitted." The postmodernist position also unravels society by rendering all lifestyles equal. Clor makes less than he could of the disconnect between these postmodernist ideas and the positions of some contemporary liberals that "equal respect is a categorical imperative." (Never to us a straw man, Clor uses Dworkin's 1977 Taking Rights Seriously as an example.) As with political moderation, there must be some recourse to values which transcend particular circumstances lest the whole enterprise of moderation be equally relativistic. Using Clor's example, a terrorist leader who compromises amongst the extreme demands of his followers cannot be considered a moderate. At last Clor tackles Nietzsche's epistemology. If we take Nietzsche's philosophy to be true, with its conclusion that philosophy is not reasoned inquiry but creativity driven by the will to power, then what do we make of it? If we do believe it, how can we believe it? Clor seems slightly offended by Nietzsche's own response to the question, that if you realize this conundrum, "So much the better." So much the better?" asks Clor. Truly? Yet Clor's moderation restrains him and he seeks a moderate view of Nietzsche, culling from the bluster that from Nietzsche's perspectivism we learn that our understanding is often only partial, that seeking the truth is not precluded but rather no one can presume to have grasped the whole of it. Despite such observations about epistemology, which Clor, perhaps with tongue-in-cheek, calls "contributions to moral relativism," Nietzsche's philosophy itself praises something and discourages others. It affirms zeal over enervation and struggle over complacency. In Nietzsche Clor does not find the philosopher of "anything goes" but of "a demanding spiritedness." "What is to be admired is "energetic commitment, which is, at its pinnacle, self-creative." [Clor, 93] Whether or not one agrees with this reading of Nietzsche, it certainly is allows a moderate person to learn something from the philosophy without committing to its extreme prescriptions. It also casts considerable doubt upon it as anything workable on its own. There is in this a bit of a challenge to the Rousseauian, Nietzschian, and post-modernist programs: if you want to live like that, go ahead, but you'll end up tempering it with something anyway. On Moderation is a terrific and spirited read. It makes the task of living the good life, navigating its extremes, seem challenging, rewarding, and even noble. The text starts with simple examples using famous political figures like Franklin Roosevelt and Churchill and eases the reader into more complex discussions of Rousseau and Nietzsche. It is judiciously footnoted with a short suggested reading list of recommendations ranging from Jane Austen to George Will. Clor is so consistently even-handed and concerned with useful learning over proving, the book is as much a model for moderation as a discussion of it. One may tire of the many "what ifs" and "on the other hand" but such scrutiny and even-handedness, such work, well that's moderation.